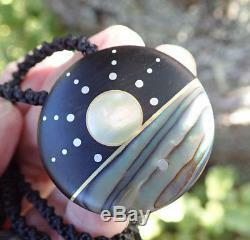 RECYCLED EBONY NEW ZEALAND PAUA SHELL STERLING SILVER NZ MAORI INLAID SUN DISK. 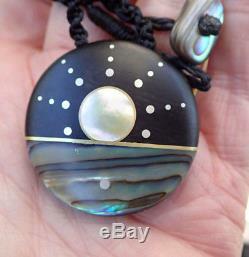 STUNNING ONE OF A KIND WEARABLE ART BY MASTER CARVER - NEW ZEALAND'S ONLY OCEAN INLAY ARTIST. 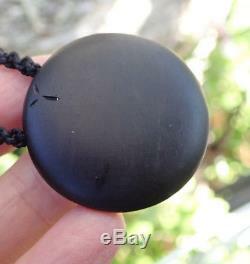 TOTALLY EXQUISITE MAORI INLAID EBONY DISK NECKLACE. Immaculate carving and finishing has to be seen in person to appreciate the full beauty of this magical pendant. Recycled ebony, inlaid with iridescent brilliant blue New Zealand Paua shell and studded and banded with sterling silver. 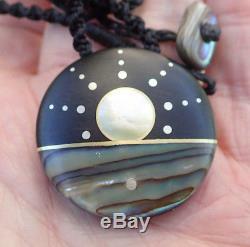 The pendant represents a Pacific sunrise and has a 1.3 diameter and a depth of 6mms. Bound through hidden holes onto a beautiful macrame hand braided 20 black cord with a rounded iridescent blue NZ paua shell toggle. Absolutely one of kind and completely hand crafted - come with a guarantee of authenticity. Authentic Pounamu Jade + Bone Carvings from Aotearoa New Zealand, the land of the Maori people and the inspiring scenery you saw in Lord of the Rings! All other buyers may choose this option if required. STUNNING ONE OF A KIND WEARABLE ART BY MASTER CARVER - NEW ZEALAND'S ONLY OCEAN INLAY ARTIST TOTALLY EXQUISITE MAORI INLAID EBONY DISK NECKLACE. The item "RECYCLED EBONY NEW ZEALAND PAUA SHELL STERLING SILVER NZ MAORI INLAID SUN DISK" is in sale since Friday, October 26, 2018. This item is in the category "Collectibles\Cultures & Ethnicities\Pacific Islands". The seller is "actonpark" and is located in North Island. This item can be shipped worldwide.